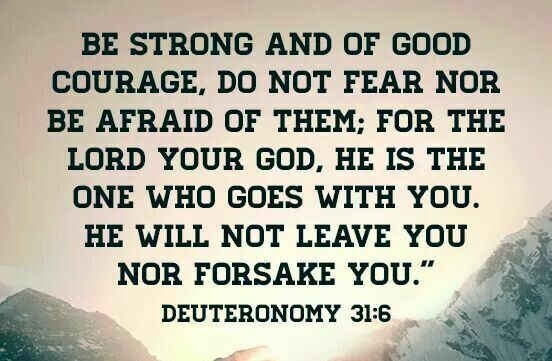 When Moses was an hundred and twenty five years old the Lord told him he would not be going over the Jordan, but Joshua would and was instructed to be strong and of a good courage(Deuteronomy 31:1-8). And Moses went and spake these words unto all Israel.2 And he said unto them, I am an hundred and twenty years old this day; I can no more go out and come in: also the Lord hath said unto me, Thou shalt not go over this Jordan.3 The Lord thy God, he will go over before thee, and he will destroy these nations from before thee, and thou shalt possess them: and Joshua, he shall go over before thee, as the Lord hath said.4 And the Lord shall do unto them as he did to Sihon and to Og, kings of the Amorites, and unto the land of them, whom he destroyed.5 And the Lord shall give them up before your face, that ye may do unto them according unto all the commandments which I have commanded you.6 Be strong and of a good courage, fear not, nor be afraid of them: for the Lord thy God, he it is that doth go with thee; he will not fail thee, nor forsake thee.7 And Moses called unto Joshua, and said unto him in the sight of all Israel, Be strong and of a good courage: for thou must go with this people unto the land which the Lord hath sworn unto their fathers to give them; and thou shalt cause them to inherit it.8 And the Lord, he it is that doth go before thee; he will be with thee, he will not fail thee, neither forsake thee: fear not, neither be dismayed. Hez-e-ki’-ah knew the Lord was with him and was able to fight his battles and when Sen-nach’-er-ib had come to fight against Jerusalem he knew it was with the arm of flesh, and told his captains there were more with them in the Lord and to be strong and courageous(2 Chronicles 32:1-8) After these things, and the establishment thereof, Sennacherib king of Assyria came, and entered into Judah, and encamped against the fenced cities, and thought to win them for himself.2 And when Hezekiah saw that Sennacherib was come, and that he was purposed to fight against Jerusalem,3 He took counsel with his princes and his mighty men to stop the waters of the fountains which were without the city: and they did help him.4 So there was gathered much people together, who stopped all the fountains, and the brook that ran through the midst of the land, saying, Why should the kings of Assyria come, and find much water?5 Also he strengthened himself, and built up all the wall that was broken, and raised it up to the towers, and another wall without, and repaired Millo in the city of David, and made darts and shields in abundance.6 And he set captains of war over the people, and gathered them together to him in the street of the gate of the city, and spake comfortably to them, saying,7 Be strong and courageous, be not afraid nor dismayed for the king of Assyria, nor for all the multitude that is with him: for there be more with us than with him:8 With him is an arm of flesh; but with us is the Lord our God to help us, and to fight our battles. And the people rested themselves upon the words of Hezekiah king of Judah.